One of my favorite things about Spring is the COLOR. After a winter of gloomy, dark, snowy days, a winter where (as always) your South Dakota backyard birdlife is dominated by the plainly colored Dark-eyed Junco, it’s so nice to have a splash of color in your backyard as songbirds begin to return. 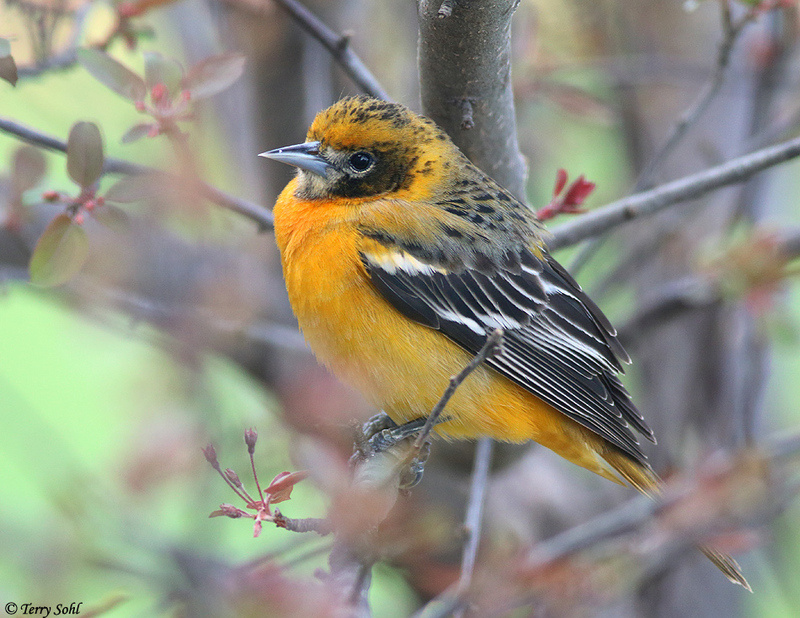 In my yard in the Spring, that splash of color has always been dominated by male American Goldfinches that have returned to their bright yellow plumage, or the handful of Rose-breasted Grosbeaks that come to our feeders. 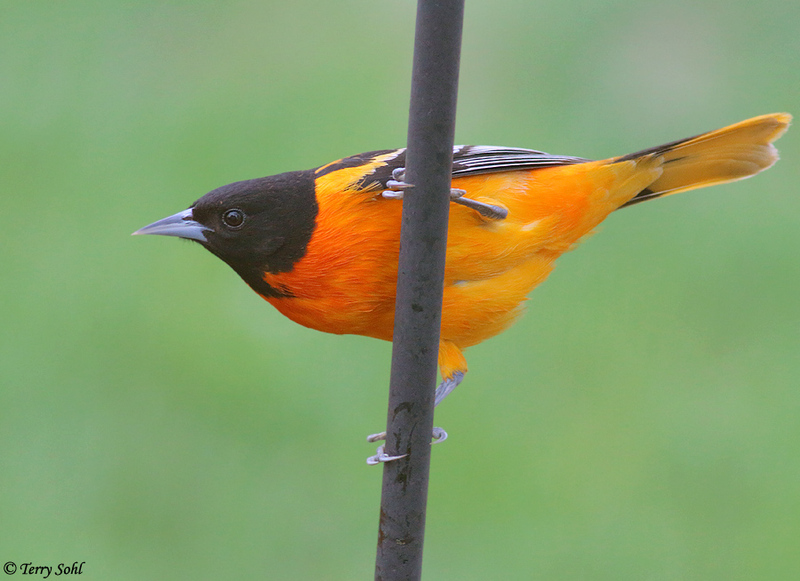 We also are used to a splash of orange in the Spring as a Baltimore Oriole may periodically visit the yard. 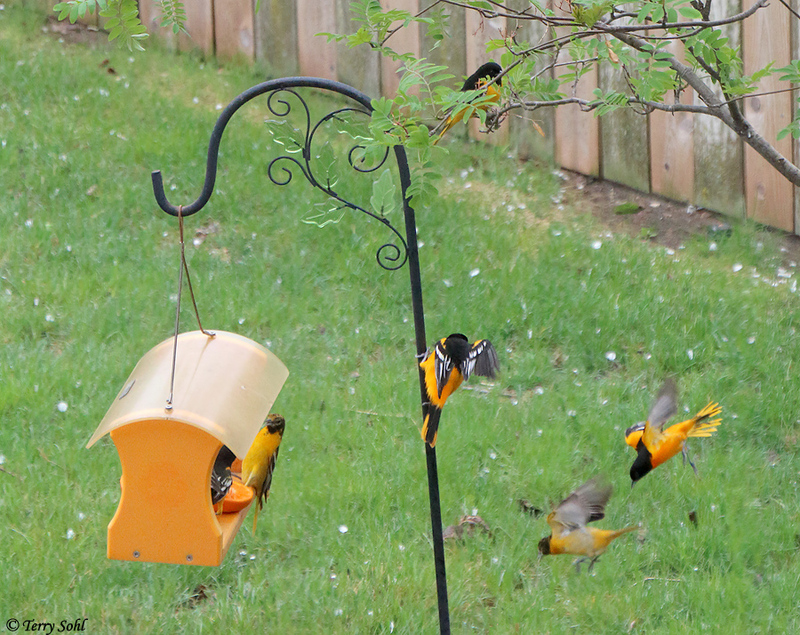 I have a jelly and orange feeder that attracts them, although they lose interest once nesting begins in earnest. 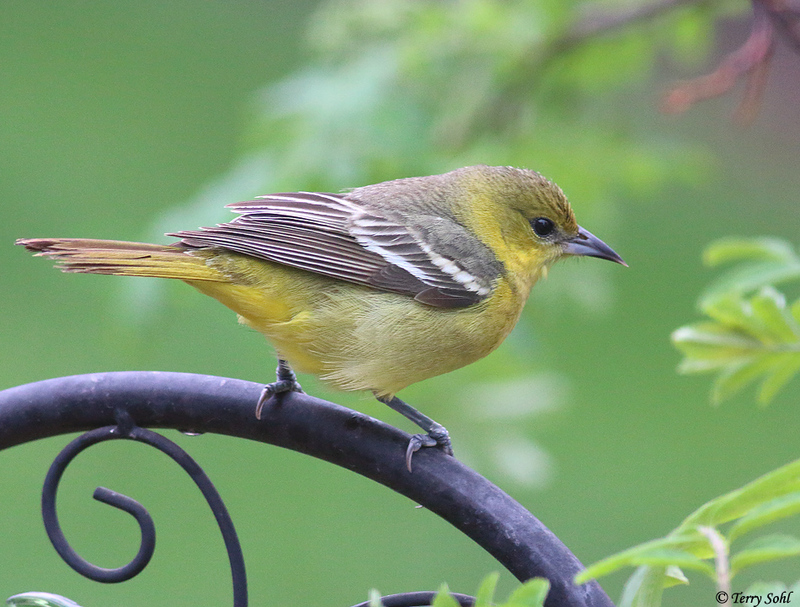 I honestly don’t remember having more than one Baltimore Oriole in my yard at one time, and I’ve never had Orchard Orioles. That’s changed! 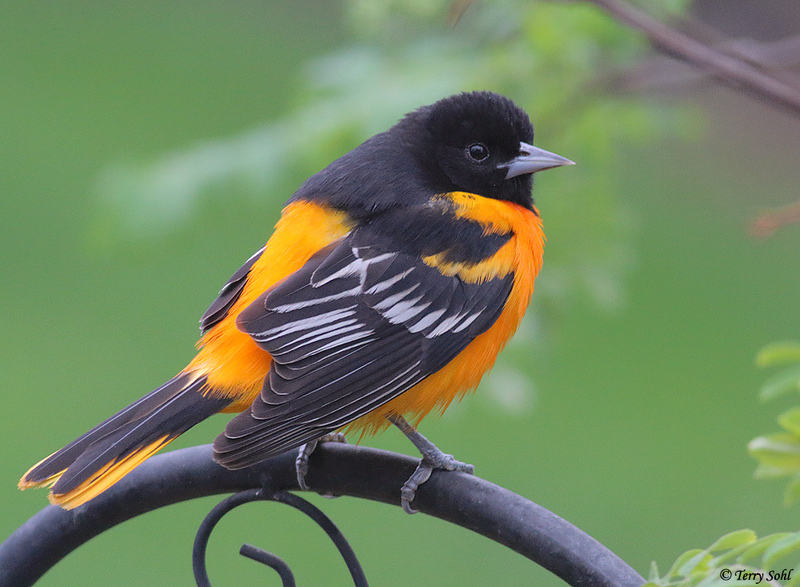 I have been completely INUNDATED with Orioles this spring! 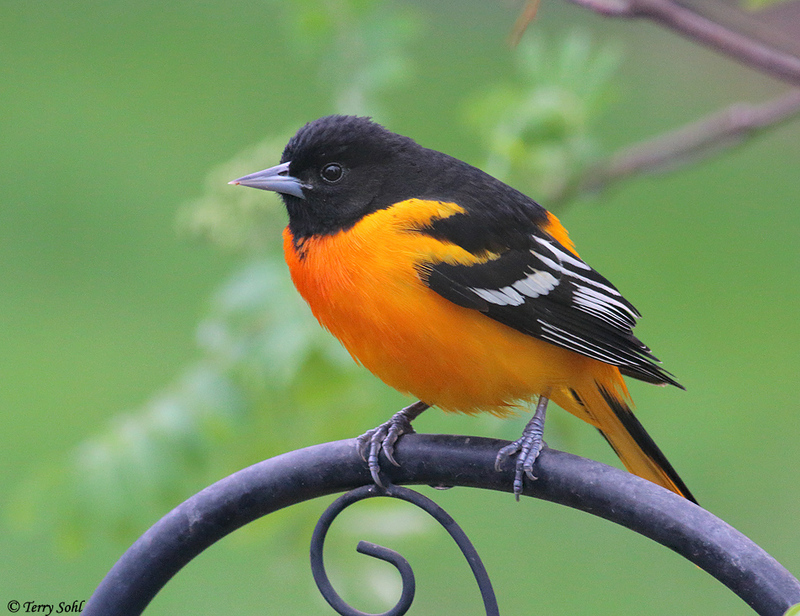 At one point Friday, I counted FIFTEEN Orioles in the back yard, with 6 Baltimore Orioles fighting around the orange/jelly feeder, 6 more moving around in the flowering pear and cherry trees along the back fence, and 3 Orchard Orioles doing the same! We’ve had a very cool, wet spring, and the vegetation and flowers are behind where they normally are this time of year. I’m not sure if that’s the cause of the explosion in Orioles in my yard, but I DO know they’re going through grape jelly like there’s no tomorrow! We’re talking a full TWO POUND jar of grape jelly per day! 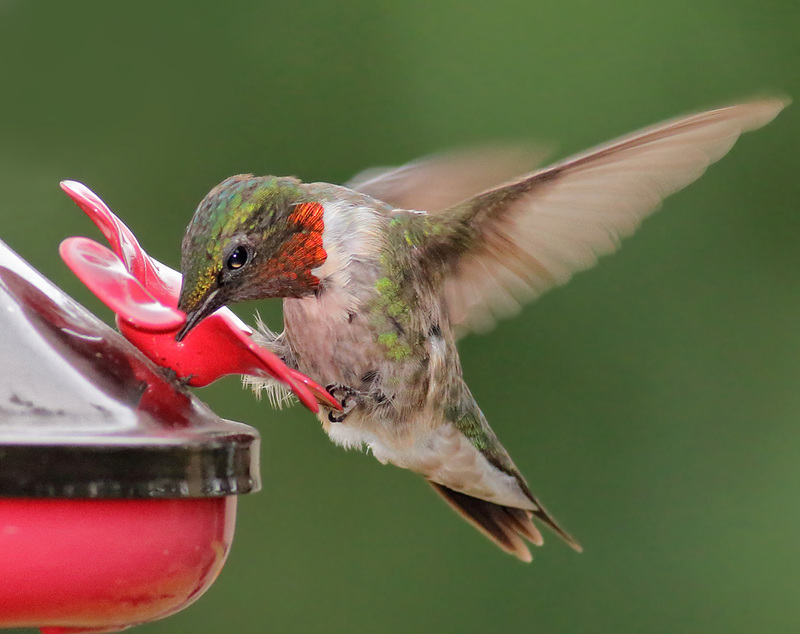 Every time I go back to the feeder to check, it’s empty! Where have my songbirds gone? “Clyde”, the very fat Cooper’s Hawk who has slowly been consuming all birds in the neighborhood. 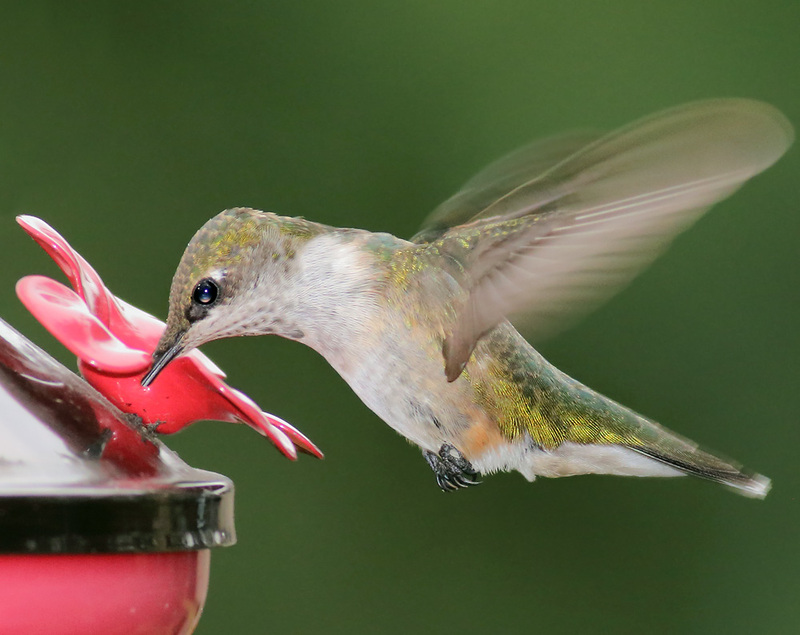 What shows up at your feeders is so unpredictable. In winter, I always expect Dark-eyed Juncos foraging on the ground below my feeders. 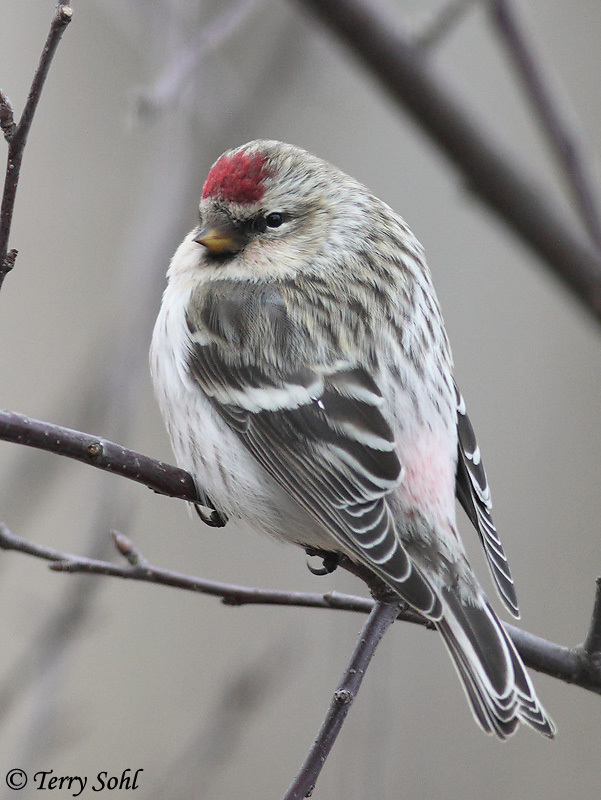 Many winters, they’re about the only bird it seems I ever see, in my yard or elsewhere. Not this year, where they’ve been scarce in my yard. That’s been made up for with many more American Goldfinches than normal. I have one very tall tube feeder, and most of the winter it’s been very crowded, with most perches full and other Goldfinches waiting in the nearby tree for an open spot. 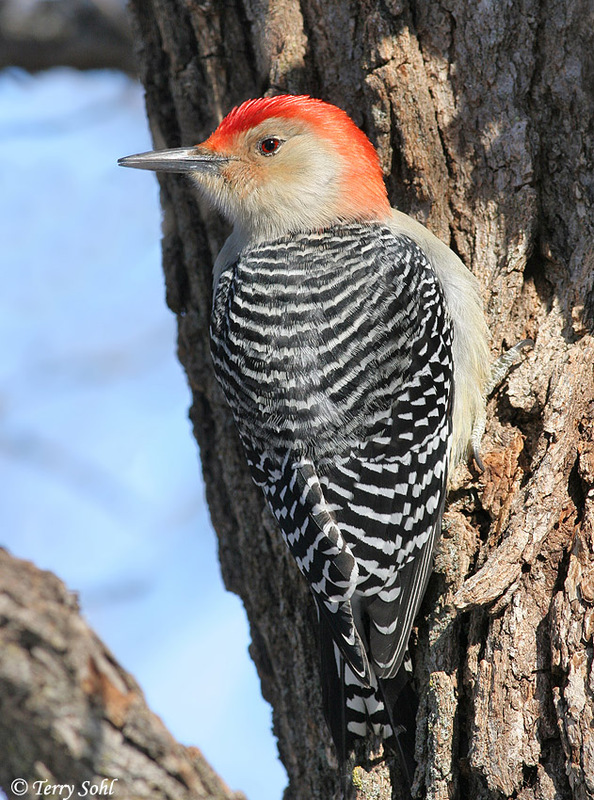 It’s been a good year for Chickadees, Downy Woodpeckers, and I have at least two (a male and a female) gorgeous Red-bellied Woodpeckers who are quite regular at my suet. 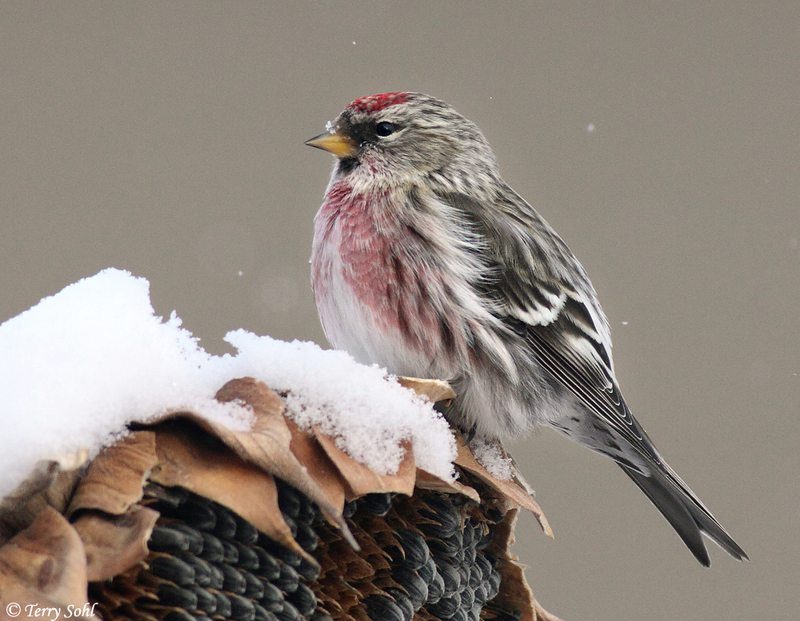 Despite the lack of Dark-eyed Juncos, it’s been a fairly “birdy” winter in my yard. That “birdiness” level has been slowly declining all winter though. Simple attrition from a snowy winter would probably explain it, but in my yard, there’s another obvious factor. That factor is Clyde. 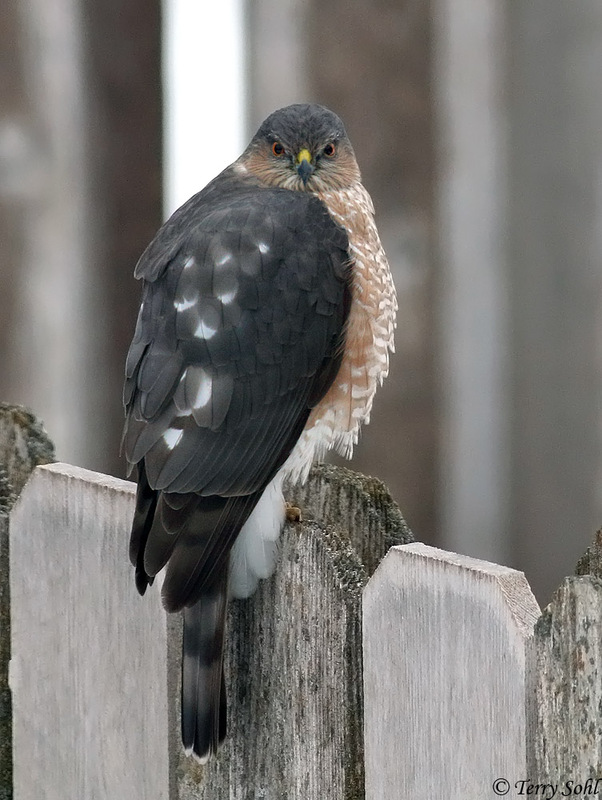 Clyde is the Cooper’s Hawk that has been frequenting my yard, and buzzing my feeders all winter long. Why “Clyde”? I dunno. It starts with a C. He looks like a “Clyde”. Very workman-like and efficient, very “blue-collar”. 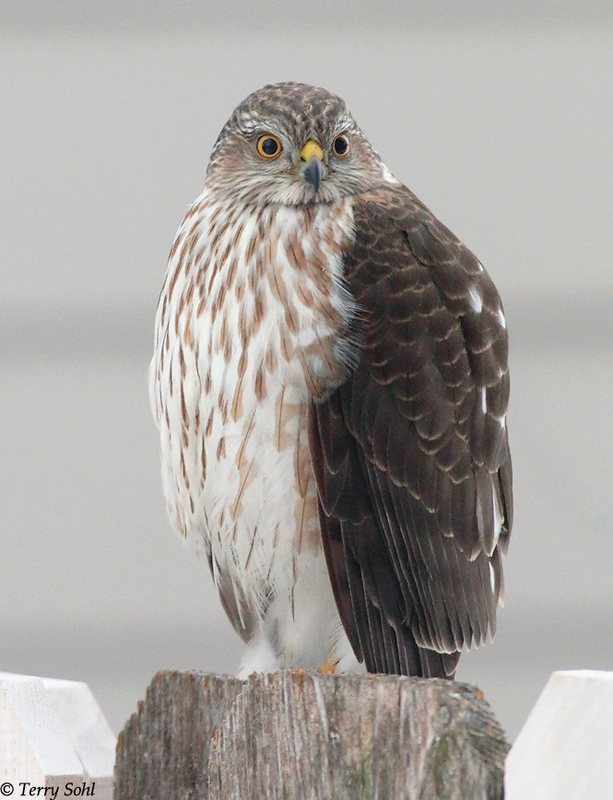 Comes in regularly every day, punches the clock, does his thing, kills a bird or two…just the same hum-drum “Clyde” kind of a life for a Cooper’s Hawk. My wife is not fond of Clyde. My wife does not appreciate the “nature” occurring in the yard. Clyde isn’t exactly subtle when he buzzes the yard and grabs a songbird. He’s also getting quite bold. Last week I opened the front door, and Clyde was sitting on the front step, munching on a goldfinch. Normally, you’d expect a wild bird to immediately bolt. Not Clyde. Clyde looked up at me, paused a second, before seemingly sighing and reluctantly flying off with his breakfast, clearly put out that I had interrupted him.I do have one concern about Clyde. He appears to be gaining weight at an alarming clip. He’s had a well-fed winter in my yard! It’s showing on his waist line, as he is one FAT Cooper’s Hawk! Unlike my wife, I do think it’s very cool to have Clyde around. With the Big Sioux Recreation Area and a lot of forested habitat right across the street, Clyde may end up sticking around the area permanently. A quite lost Great Kiskadee, casually hanging out on a post on a sunny day in “warm” South Dakota. 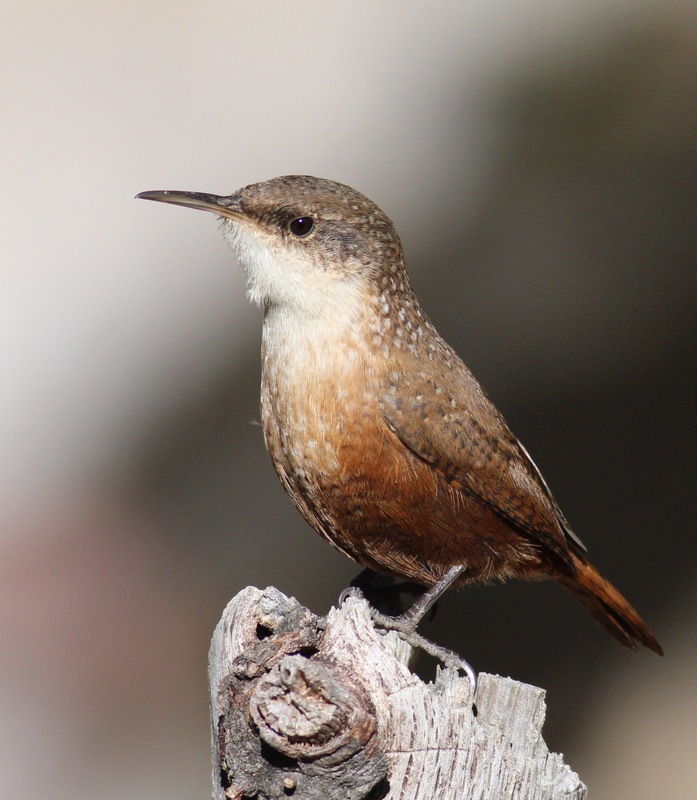 A couple of weeks ago, the South Dakota Ornithologists Union (SDOU) had their fall meeting in Brookings, South Dakota. As the meetings were going on, the folks in attendance became aware of an incredibly unusual sighting in the area. 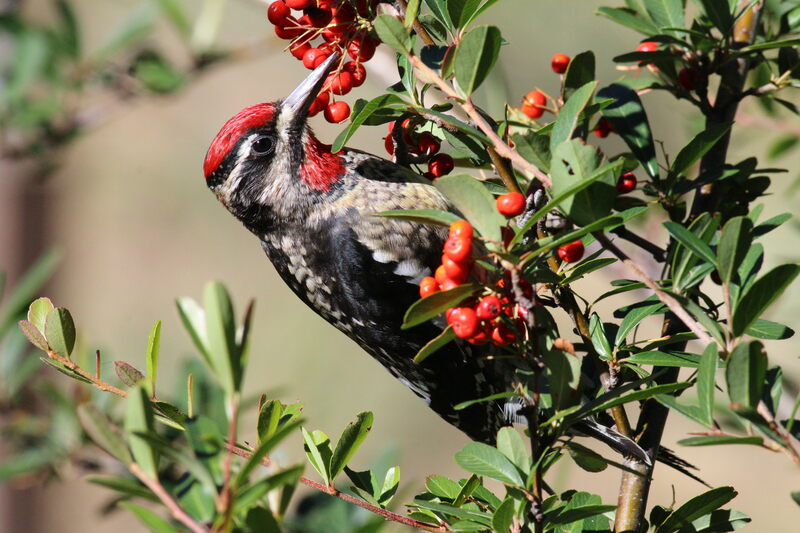 A landowner near Volga had reported seeing at least two Great Kiskadees in her yard, stating that they had been hanging around since at least August. 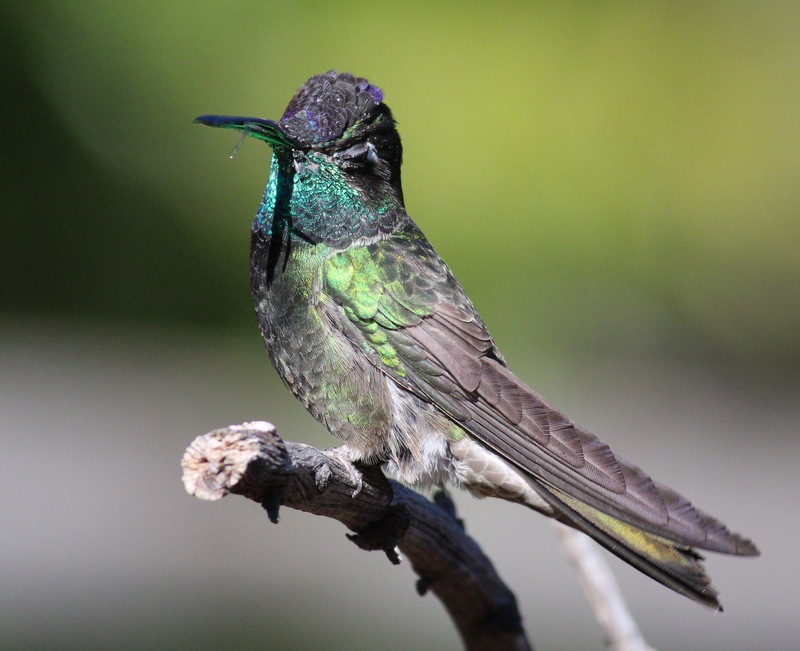 Great Kiskadees normally are found in Latin America, as they are warm weather birds with a range that just reaches into the United States in far southern Texas. In the U.S., there have been a handful of sightings outside of Texas. Of these, there have been several in Oklahoma, a handful in Louisiana, and one or two in Kansas and New Mexico. The one found in central Kansas was incredibly unusual in its own right, occurring hundreds of miles away from the next closest sighting. 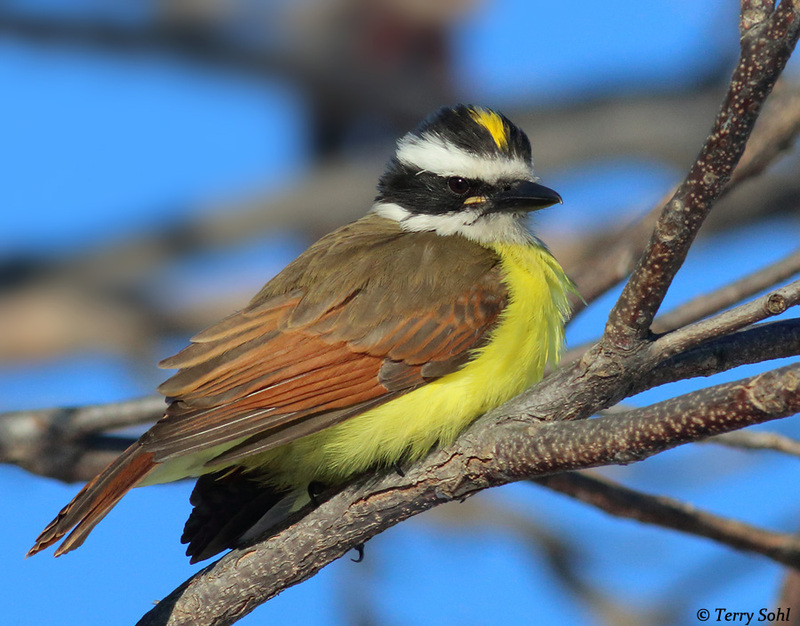 Hence, a Great Kiskadee? In South Dakota? 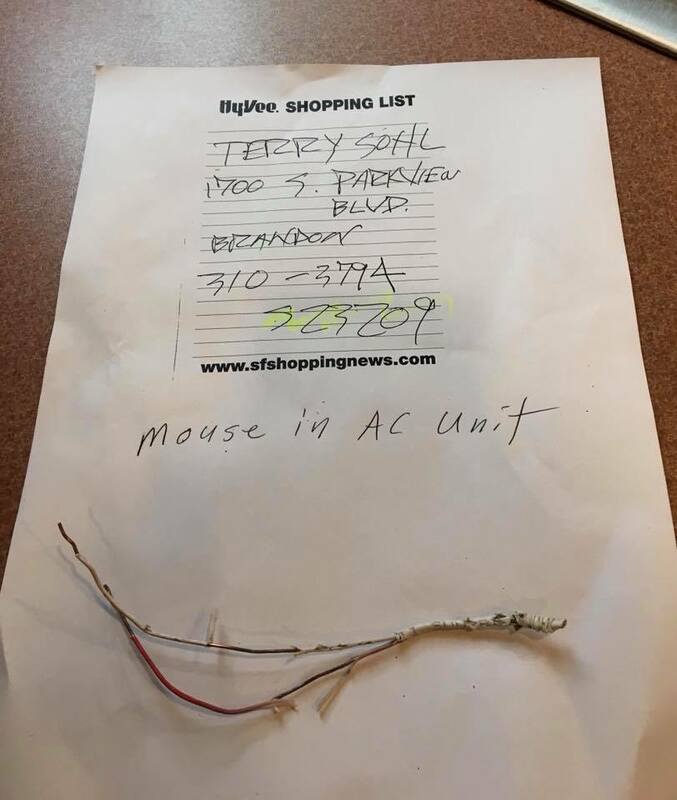 In November? The SDOU attendees were understandably skeptical. The skepticism vanished when a conclusive photo was provided, and most people attending the meeting got a very exciting treat, making the short trip to the farmstead where the bird (birds?) was seen. I was out of town on travel at the time. When I got back, I told myself that maybe if the bird were still hanging around, I’d head north to try and see it (and photograph it). A couple of weeks passed, and I managed to make excuses not to go. In other words, I was being lazy!! 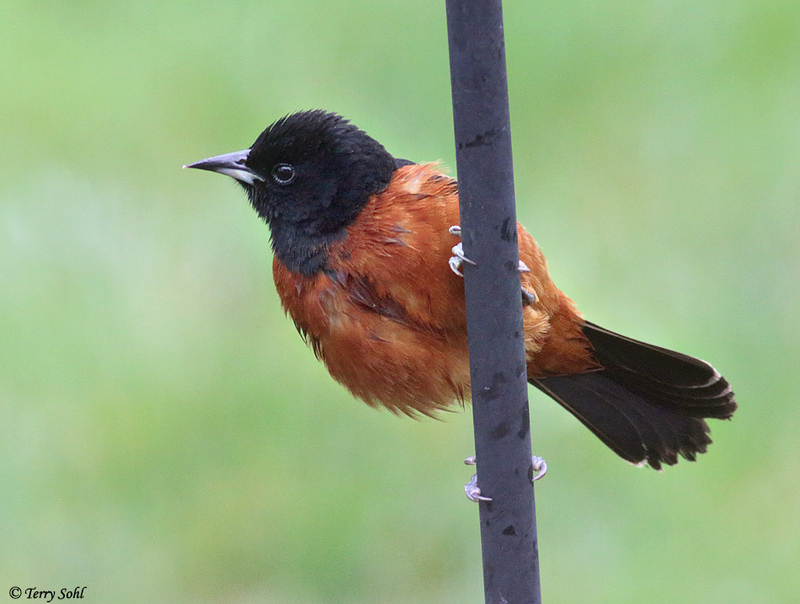 Honestly, I rarely have any luck chasing single birds like this. However, today, serendipity struck. I was walking in the hall at work this morning, and passed my friend Pat, who is also a birder. He had seen the Great Kiskadee, and we started talking about it. 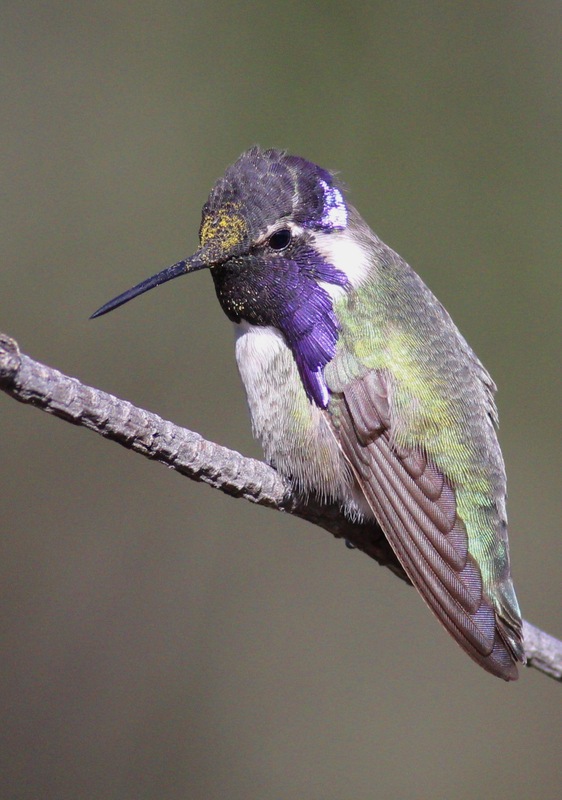 He noted they were still seeing the bird relatively recently, and it got my mind wandering, in the way that a mind sometimes WILL wander on a Wednesday at work. After several days of gloom and snow, the sun was finally out. What was better, sitting in a windowless office, or going out searching for a mega-rarity? In no time I grabbed my coat, headed home to grab my camera equipment, and then started north towards the area where the bird(s) was being seen. 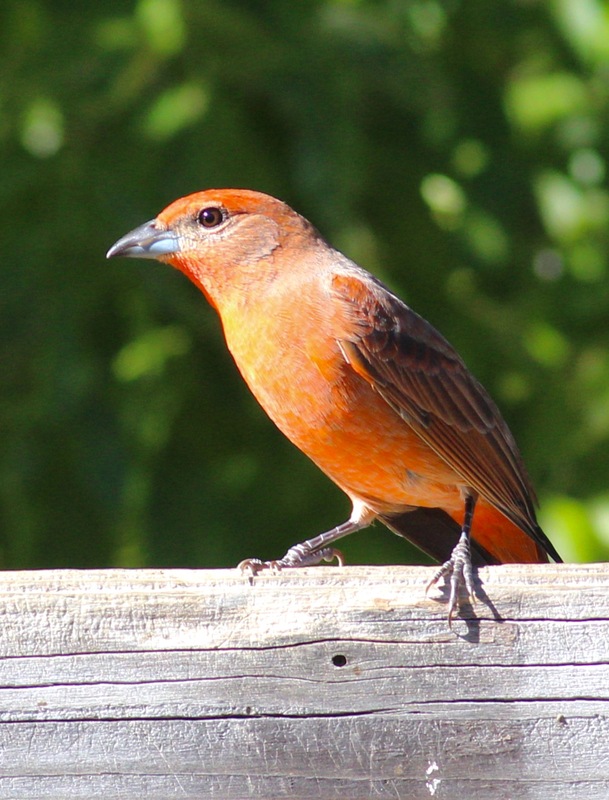 There are two farmsteads adjacent to each other, and the Great Kiskadees had been seen at both. Having been told the south farmstead had an extensive feeder setup, that’s where I headed. 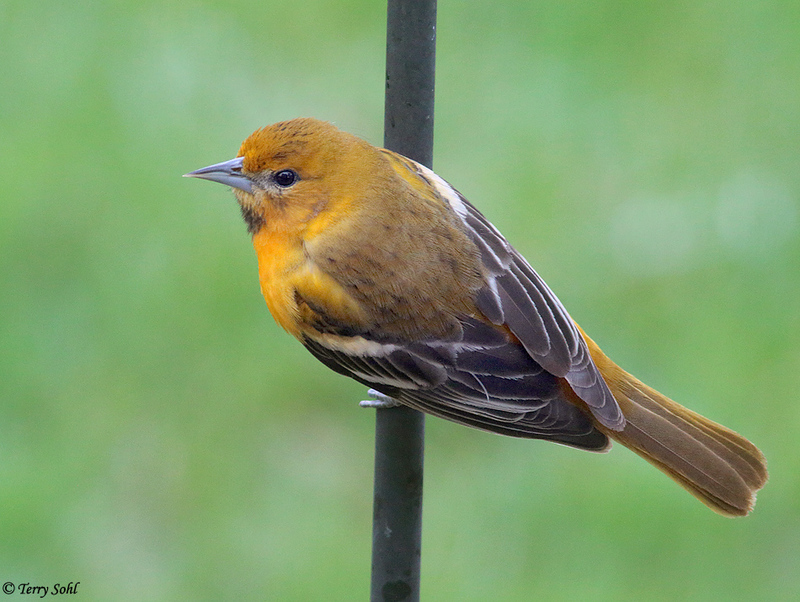 With a big snowstorm ending just the day before, I thought surely the bird would be hanging out by the feeders. I called the landowner and asked permission, and ended up walking around her land for an hour, and hanging around her feeders for another hour. No luck…no bird. Snow. That’s a Great Kiskadee, sitting in a pine tree covered with snow. I would bet there haven’t ever been too many similar photos taken. Par for the course, when I chase a lone bird! 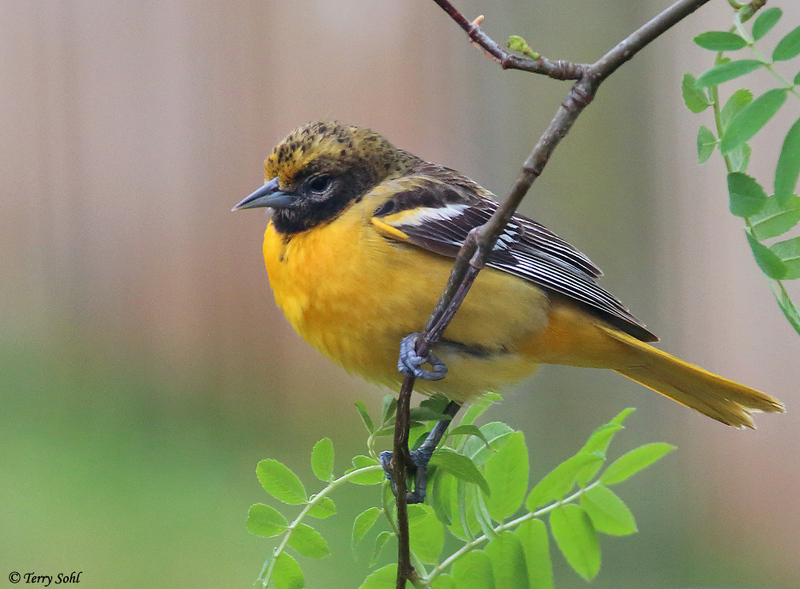 I got back in my car, sent a quick note to the South Dakota “listserver”, informing birders that I had tried, unsuccessfully, to re-locate the Kiskadee. Perhaps the snowstorm was too much for a tropical bird, I thought. That’s when our digital, instant-communication world saved the day. 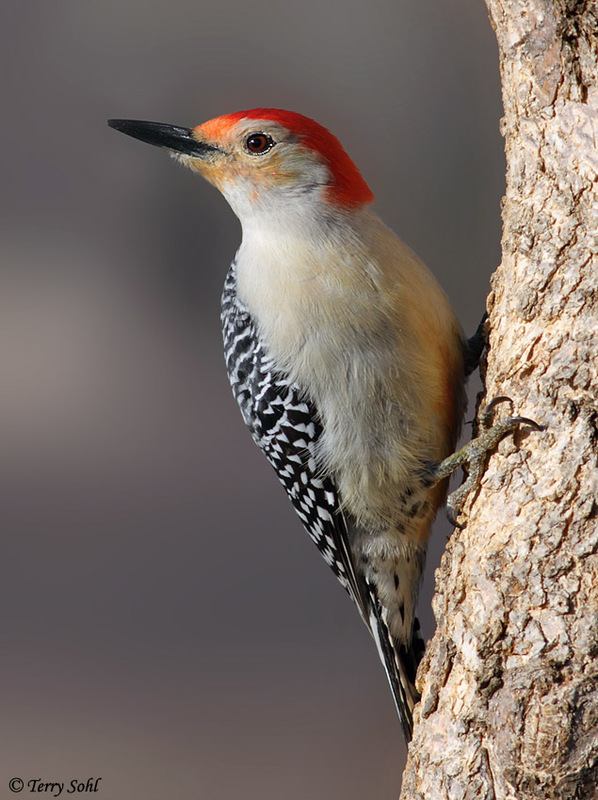 “KC” replied almost immediately to my email to the listserver, telling me that he had seen the bird just this morning. I spent nearly all my time at the southern farmstead, but he said the bird was now hanging out almost exclusively at the northern farmstead. I was only 5 miles away when I noticed his message, so I turned around and headed back, this time going to the “right” farmstead. It only took 2 minutes of looking before I saw the bird. The landowners had set up special feeders just to try and help the wayward Kiskadee, with suet and mealworms provided for it. Within 2 minutes of walking around, a lone Great Kiskadee came flying into the feeders, along with some of his new buddies, 3 Blue Jays. What a gorgeous bird! 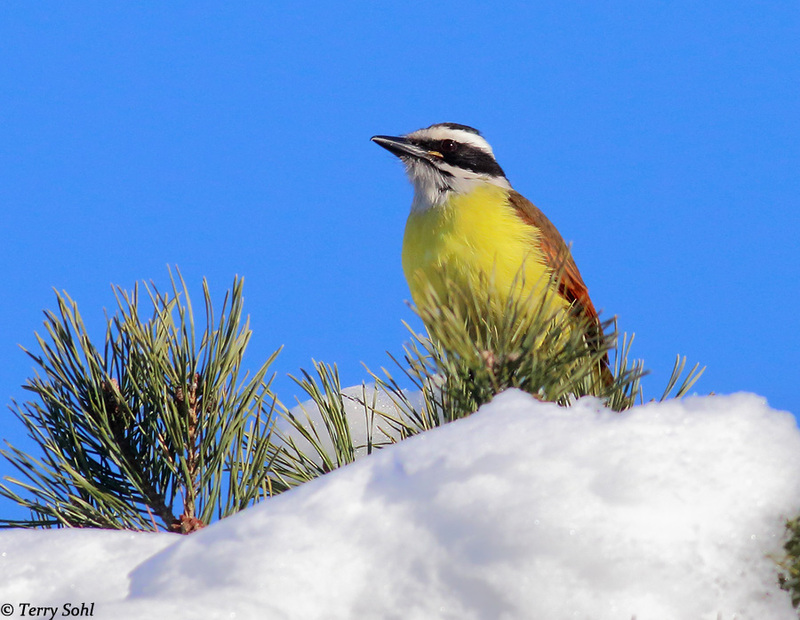 A bright splash of yellow isn’t exactly a common sight for a birder in South Dakota when there’s a foot of snow on the ground! 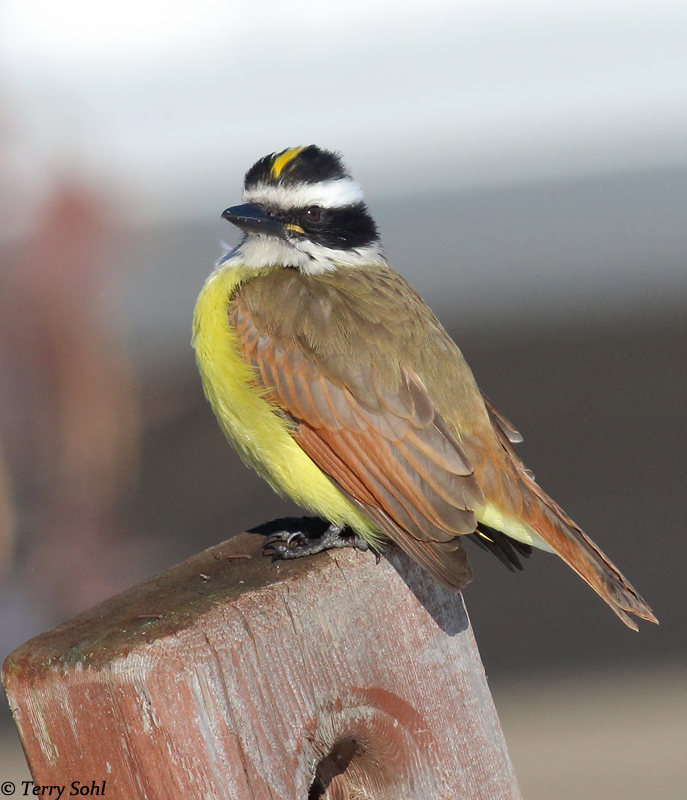 The recent snow doesn’t seem to have hurt the Kiskadee. He seemed fat, happy, and was feeding very well. I ended up watching and photographing him for about 45 minutes as he flew back-and-forth between the feeders and the surrounding trees. He wasn’t shy, either, ALWAYS a very welcome development for a bird photographer. When I awoke today I was expecting the same old grind at work! Thanks to bumping into Pat in the hall, and thanks to my own TRUE talent at finding excuses to get away from work, a normal work day turned into a truly once-in-a-lifetime birding day! A Great Kiskadee in the snow and cold of South Dakota in December! 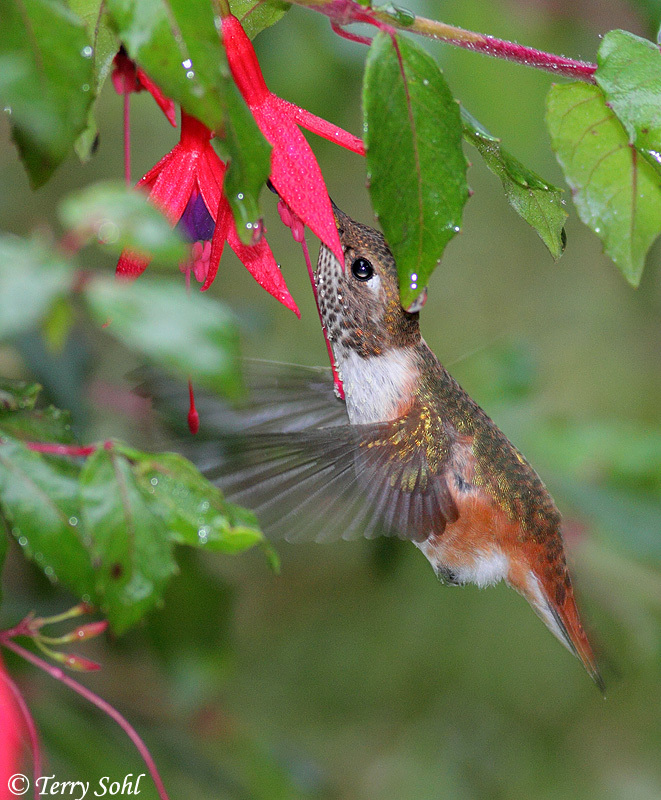 Drink up little Rufous Humminbird! One flower down, 1,163 cans of Coke (hummingbird equivalent) to go!! I can relate to this. Pop (hey, I’m from the Midwest, it’s “pop”, not “soda” or anything else) is my downfall. I don’t drink coffee, and especially during the week, a can of pop somehow makes it into my office. Mostly it’s Coke. If I’m really having a bad, tiring day, a Mountain Dew has been known to slip into my office. But having an occasional can of Coke is nothing, if you read this story. 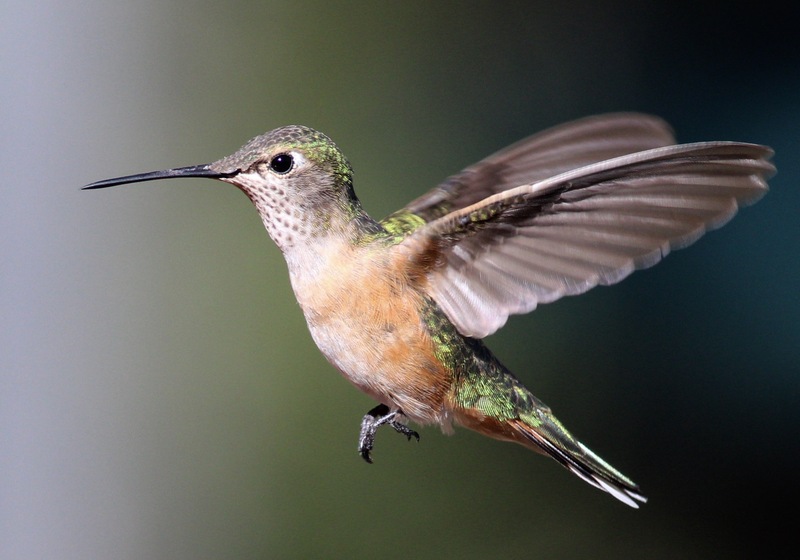 Given the metabolism of a hummingbird, they consume half their body weight in sugar every day. As the article notes, an equivalent would be a human being drinking 1,163 cans of Coke a day, or 1,106 cans of Pepsi (Pepsi has more sugar). Therefore, I have determined my occasional can of Coke isn’t bad. It may actually be a health food, based on this comparison. Not only am I drinking the “right” pop in Coke (the less sugary one), but I’m only drinking 0.09% of my daily allowance of sugar, in hummingbird terms.